I've been watching Vancouver Whitecaps games with my dad.since he first took me to Empire Stadium when I was 5 to see them host the NY Cosmos (featuring one Pele). So it was great to see the 2nd last regular season game for the Caps at Swangard with him last night. Pity Montreal beat them 1-0. Posted on September 26, 2010 by Scott Forrest and filed under Football, Travel and tagged footie swangard vancouver whitecaps. While waiting to catch a bus downtown from my folks place in North Vancouver yesterday, a bus passed going the other way with a billboard ad on the side reading something like, "Etälä Suomen Lääni". It took a few moments for me to remember that I was actually no longer in Finland, so seeing Finnish text on the side of a bus should be rather unusual, to say the least. Marjo helped me track a version of the ad down, which is part of Diesel's rather questionable 'global warming' campaign. While Diesel's online content seems to show them wanting to promote awareness about global climate change, the underlying message in the ads seems to be "instead of trying to stop global warming, just go with it because the future will be hotter and sexier." This seems to be exactly the critique of Climate Change Denial, where we found this image. Then while on my way downtown, I noticed that a woman in front of me had a tattoo across the back of her neck in Inuktitut syllabics. Is this the successor trend to the cultural appropriations of tribal, Celtic, and the omnipresent Chinese characters by people with zero connection or actual awareness of the original cultures and contexts? In the wake of the near universalization of the Inukshuk in Canada, such as in the Vancouver 2010 logo Inuit culture seems to be wide-open for appropriation (no doubt going back to soap stone carvings and beyond). While it is possible that this woman was actually a pale Inuit, somehow I doubt it. It looks like "jiasika" to me. Any of my Inuktitut speaking friends care to translate for me? Posted on July 13, 2007 by Scott Forrest and filed under Canada, Finland, North, Travel. The keen-eyed may have spotted my pics from last night's Depeche Mode gig at Helsinki's Hartwall Arena in the Flickr photo badge. Pretty great show from my all-time favourite band. There was a great omen when I looked at my ticket and discovered I was sitting in seat 101 of section 101! How cool is that? They started with many of the tracks from the new album, Playing the Angel, before getting into the real classic crowd pleasers. A personal treat was the first encore, a kinda 'acoustic' version of Shake the Disease with just Martin and a piano-tuned synth. Pity the finnish crowd wasn't really into the whole crowd participation thing. Hope the band understand cultural differences. Hard to believe it was almost 20 years ago when I saw them for the first time. 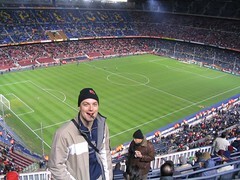 Posted on March 7, 2006 by Scott Forrest and filed under Finland, Travel, Tunes. I fly back to Vancouver on Tuesday, so I'm getting myself ready to go this weekend. Lifehacker has a bunch of great travel tips that I'll try to put to use this time to smooth things along. Packing used to mean remembering things like rain gear and comfortable walking shoes, but with our ultra-modern lifestyles, trip preparation increasingly means making sure your media is travelling with you as well. Since I haven't broken down and bought a portable video player yet, I'll be putting a few tv shows and movies on my laptop and a bunch of tunes, podcasts and Teach Yourself Catalan on my mp3 player. One of the reader tips on Lifehacker was to use Slogger to store some web articles offline to read. While this is a a great application and idea, I think I'll save my laptop battery for video enjoyment and do my reading in traditional book and magazine form. Thankfully, I don't have to worry about copying any more media for the trip than what I'll need in transit, since I can now use either FTP or Orb to access my whole collection online. Now I have to stop blogging and start packing! Posted on December 17, 2005 by Scott Forrest and filed under Organization, Travel. 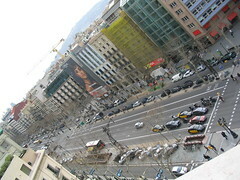 I just returned from a short but very memorable trip to Barcelona, vistiing Marc and my beloved BarÃ§a. A nice selection of photos are now up on my Flickr account. I caught an early flight on Tuesday morning, just in time to do some shopping before going to my first ever Champions League game. BarÃ§a demolished Werder Bremen 3-1, fielding Larsson in place of Eto'o. Marc actually didn't get back from Calgary until Thursday, so I went to the match with his good friend Pere Grau (gracies, Pere!). Wednesday and Thursday I mostly spent money I don't have, including selling my soul for BarÃ§a gear at the Camp Nou megastore botiga. After Marc returned, he braved jetlag to drive us up into the mountains for a great day hiking about in the forest and a country lunch (mmmm... rabbit). The delicacies continued to flow back in BCN as we met friends for a Kashmiri meal and then drinks in the Raval district. Saturday was back to the countryside, staying at Marc's grandparents place in Sant Hilari Salcam. Great little town, and would be an ideal place to get away when I'm finishing off my thesis in a couple years. We spent the night there, and stopped for lunch at his uncle's in Besalu before returning for the match against Racing Santander. Another commanding performance from Ronaldinho and company. Eto'o scored an impossible opener, walking through four defenders, and it was off to the races! Yet again, only a penalty saved the opposition from being kept off the scoresheet entirely. 4-1 final. Visca el BarÃ§a, i visca Catalunya lliure! Moltes gracies, Marc! Posted on November 30, 2005 by Scott Forrest and filed under Travel. 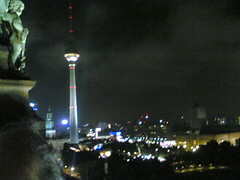 While I was talking to my friend Jussi last night on Skype, I decided to go visit him in Berlin... tomorrow. I booked my flight using points and received my e-ticket via SMS while I was still talking to Jussi. Technology is my friend. Back in a week. Laters all! Posted on April 27, 2005 by Scott Forrest and filed under Travel. Not exactly northspace, but it seems to make everyone I talk to in Finland raving jealous. Yes, I'm in Hawaii. 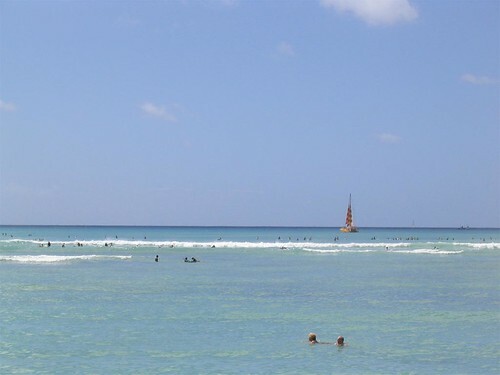 On Waikiki Beach. For work. I'm here attending the 2005 International Studies Association Annual Conference in at the Hawaiian Village Hilton. When I left Rovaniemi is was windy and -10. I just heard it was -25 today. I just went swimming in the ocean, but the water was a bit to warm. Already getting a pretty good tan. Some interesting panels in the conference, but also lots of time for leisure activities, shall we say. Absolutely brilliant. 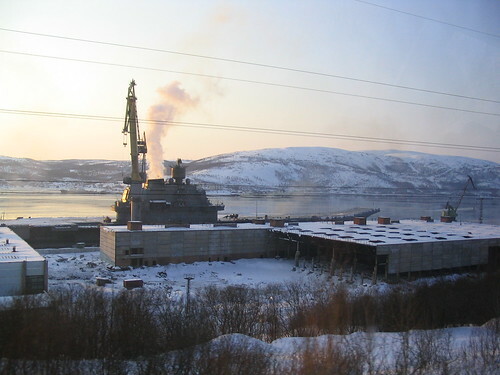 My punishment is that I'll be in the Kola Peninsula next week. :( At least it will be cheaper there. Posted on March 5, 2005 by Scott Forrest and filed under Travel. Frankfurt, after coming straight from breakfast at First Beach and a walk around Lost Lagoon (Vancouver for the geographically challenged), I emerge at the same time of day in Frankfurt, albeit a day later. With no sleep, I'm experiencing just that kind of lost in time feeling that only happens in airports, which was captured quite well in Fight Club. 'Could I wake up as a different person?' Still two more flights and ten more hours before I'm home. Luckily I have a good haul of media consumables and duty free to keep me company when I get there. Posted on September 27, 2004 by Scott Forrest and filed under Travel. I'm starting to feel like more and more of a tourist each time I come back here. Vancouver has changed a lot. Some nice, but mostly I notice the bigger gaps between the trendoids with their Hummers and Verace, and the junkies and panhandlers. Still, there's no better city for natural setting, but I wonder if that's enough. We'll see how Rovaniemi compares tomorrow. See ya'll! Posted on September 25, 2004 by Scott Forrest and filed under Travel. Hi all, I've been hanging out in western North America for the past couple weeks (Fairbanks, AK and Vancouver, BC to be precise), which may explain my brief absence that none of you have noticed. Wrapped up my last UArctic meeting in Fairbanks, and began my new research "career" at ICASS V: the International Arctic Social Science Association's 5th triennial congress. All good fun, and my paper seemed to be well received. Nice to see some old familiar faces, and meet some new ones as well. Plus I managed to survive my first post-911 experience in the US ok. Spent my birthday week seeing some friends and family in Vancouver and catching up on some shopping. Nice. I also checked out my brother's new pad in trendy Yaletown. Heading back North to Lapland on Tuesday, and back to what I call "normal". Posted on May 31, 2004 by Scott Forrest and filed under Travel, Tunes.